Even noobs like me, with no special interest in winrate, are affected by this. A lesser winrate is your personal ability, Military honor is your honor, and extremely more important. Really, it isn't. It's just been invented by Wargaming, it isn't a real thing. A further layer of smoke and mirrors to distract from core gameplay. Play to the strengths of your tank in that game and on that map. Never go alone. If some lackwit suggests a strategy that's patently wrong, and the herd goes with him, follow at a respectful distance until you know where the reds are and then put yourself in the best position to damage them without dying. Note: I have failed to follow my own advice recently, which has dented my winrate. Honour rating is average. IMO the MH system is just another form of player communication, albeit one that is used to generate statistics. Because many people agonise over their WR, it doesn't surprise me that the honour rating is also attracting much attention. While i can see the point of MH i think it masks a more long term issue - the lack of a dedicated mandatory training system in-game. Anyway at the end of day i know my contribution to the game. Vote me up or down. Whatever. Edited by Birdistheword15, 30 May 2017 - 09:31 AM. After 1 game where I had a go at someone who called me a moron for not following his lead, he then tells others in team to vote me down. I then get a message stating my military honour is reduced due to complaints! What a Croc of crap, the amount of times I've had 5 or 6 kills in one game, but let's ignore that and demote someone due to the actions of some arseholes in 1 game. Not fair at all developers!! You should look at overall gamer involvement. Feel like losing all stars just for he'll of it. Yes in fact, your actually rating is **. But look at your stats and history, please. There was no Radley or Pool medal for 5 or 6 kills since update 3.9. The last Pool medal on day before the update (05.23.) - nothing seen since Update 3.9. Even "noobs like me" with no special interest in winrate, are affected by this. A lesser winrate is your personal ability, Military honor is your honor, and extremely more important. Edited by bladefury_1, 30 May 2017 - 03:33 PM. Well, was talking about winrate, and noob in general terms. You are as noob as you feel, ofcourse. Indeed, disregarding it is best, but it ain't easy. 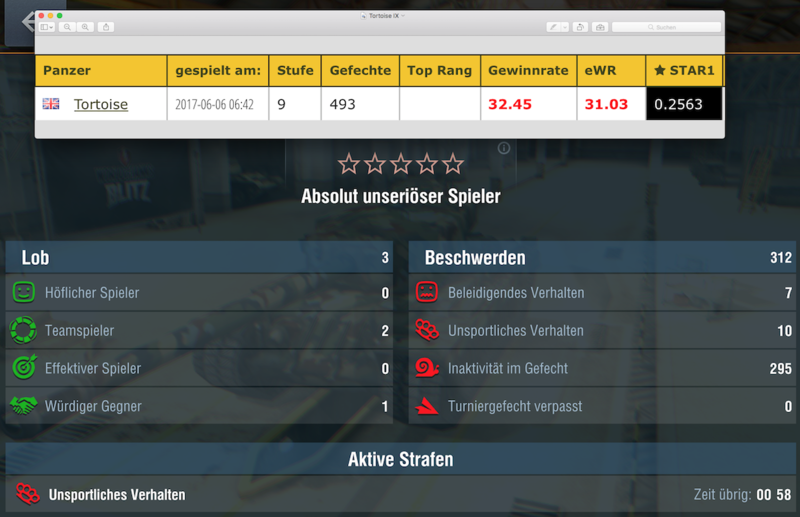 I think blitz is an sich a very nice game, so it really hurts when stupid mechanics is hurting it. Complaining about the unwelcome and praising the worthy. Give Idiots Some matches to play with....... and they Will start A fire. Although the idea was praiseworthy, in practice iT became shambles. I pitty the players with TD's as they probably suffer the most. I think A few players are left who take iT seriously. The majority are not interested anymore and do not care to vote. yeah, these guys are right! every run-down noob can abuse this feature. in just two days, I lost all my stars. moreover, I can't vote because my **24 hours player asessment time is up**, whatever that means. oh, and please stop replying so goddamn much! you're blocking the server! Apart from that, the fact that platoonmates and clanmembers can upvote each other is ridiculous. Even when it is not counted towards the hono(u)r rating, it makes the system somewhat laughable. what is my actual Rating? 4.5k damage, 5 kills. Sole carrying survivor. No votes. 3.2k damage, 4 kills. No votes. 2.1k damage, 4 kills. No votes. 3.1k damage, 5 kills. Sole carrying survivor. Provocative communication vote (only "communication" in the game was an "affirmative" in response to a teammate calling SOS). 2.4k damage, 3 kills. No votes. 2.3k damage, 4 kills. No votes. The system's working well, I see. Yaaay! 3k damage, 3 kills. Effective teammate vote. Edited by Skullcandy, 02 June 2017 - 04:19 AM. I think we should distribute positive ratings to the weaker players only if they deliver properly and decide decisively the battle result. I experience all too often that weaker players have negative entries more than enough, positive rather hardly. If I see such a player outgrown, I do not hesitate with a positive vote. After 124 games since update 3.9 your MH rising up from *** to **** MH. After a good performance you can not always expect a good vote, because the positive votes are very rare. Met this doughnut in battle. He definitely deserves all those negative votes. Just sits at spawn watching the red tanks shoot him and doesn't shoot back. No he's not AFK, he turns his turret to watch both the red and green tanks, just doesn't move from spawn to do it. Classic XP farmer. Edited by Skullcandy, 05 June 2017 - 04:55 AM. Still 3 worthy opponent ???? Yes, you are right! Since update 3.9 I observe three player like this. In only one case we have two penalties by 1h - that's frustrated. Edited by Eulengesicht_2014, 05 June 2017 - 03:33 PM. All other options are useless. Edited by Eulengesicht_2014, 08 June 2017 - 04:26 PM.